I include these artifacts here for their iconic value. Religious people used to marvel over the bone that was reputedly the thighbone of a saint. I please myself by contemplating more secular items: the only Dave Tough signature I’ve ever seen, the angular calligraphy of someone who knows what he is doing and what effect it might create, and (below) the record label from the only session he ever led. 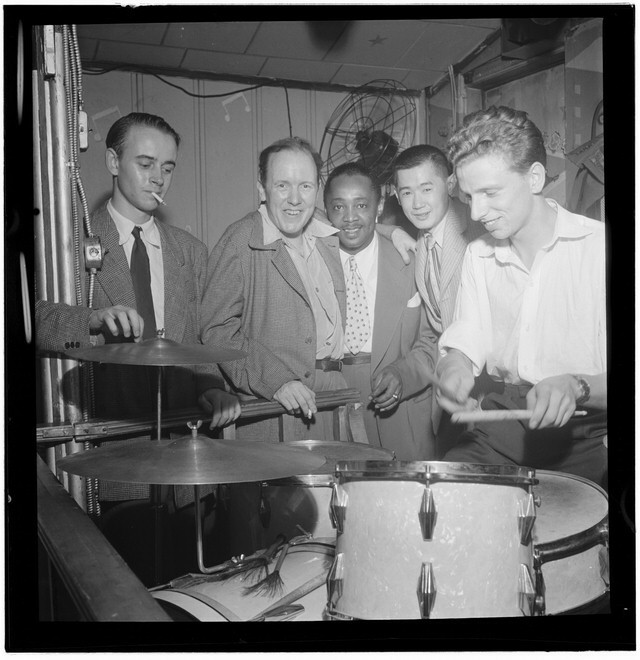 I think that Tough would have regarded bandleading with much the same disdain that he afforded drum solos, but at least this group was a fine quintet, especially for the presence of the luminous trumpeter Joe Thomas and the underrated pianist Bernie Leighton. P.S. The Jamboree session has the look of a Harry Lim endeavor for Keynote; is this the case or was it simply that the A&R man at Jamboree had liked the Joe Thomas – Ted Nash combination and wanted some for his own label? Jamboree didn’t last long, but they also recorded Don Byas and Buck Clayton, so the label’s good taste was evident.